German heavy lift expert Combi Lift has successfully completed the first phase of the Gazprom Amur Gas Processing Plant Project in Russia. The last cargo was delivered to Svobodn y one month before the last contractual delivery date. 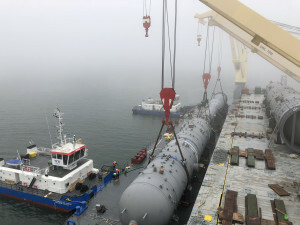 About Combi Lift: Over the last 18 years, Combi Lift’s experienced mariners and engineers have become experts in the worldwide transport of heavy lift and project cargoes. From the outset, Combi Lift has focussed on developing smart and efficient engineering solutions for complex logistics tasks. The Harren & Partner Group affiliate provides clients with customised solutions that suit individual demands and expectations, developed in close cooperation with expert teams.